We are deeply saddened to report that former President Linda Sarno has passed away. As President in 2004 and 2005, Linda helped revive FACCOC and leaves behind a legacy of relationships, friendship, and inspiration to all members and the community. 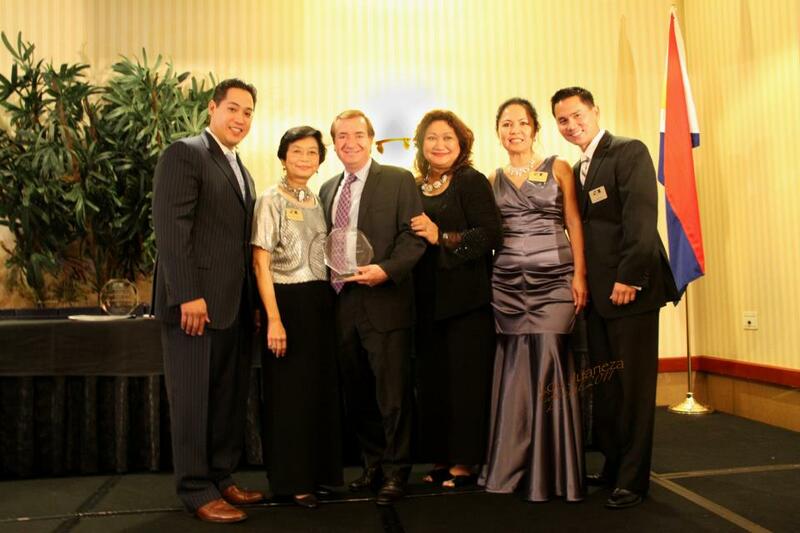 Linda Sarno (2nd from left) with Representative Ed Royce and FACCOC Past Presidents. View our photo gallery with Linda Sarno here. Do you have a memory of Linda you want to share? Please leave your memory below in the comment section. We sat at the same table and she introduced me as a presenter. Linda and I shared many conversations and programs. In fact she introduced me to Quest Diagnostics a firm that later participated with me on several programs. Linda was the go to person when we needed to anything done. I am personally saddened by the news about Tita Linda. A burden the last two days. Likewise with our MWD family. Linda was an epitome of persistence and dedication. She knew she had a big task on hand reviving an organization that is culturally unique and at times challenging. Nonetheless, she focused on that work, knowing that as Orange County grows economically, she must make sure that the Filipino American business person must be part of that growth. I will personally miss her. Surely, in my life I can say, I am very honored to have met a tolerant, dedicated and persevering leader that Linda was. God bless us all! I first met Tokaya Linda about ten years ago at the Philippine Consulate General in LA. It was during one of the literary events sponsored by our bookshop and if I remember right, we launched that night the book, “Don’t Ever Tell Me You Can’t” by Celia Ruiz Tomlinson, a successful entrepreneur from New Mexico. While talking to her, I found out that we both came from the same school in Manila, the University of Santo Tomas and that we had some mutual friends. I was impressed by her credentials and we promised to see each other more often to exchange views. However, time was always a problem but we did managed to speak on several occasions over the phone. When she got sick, our communications were limited to emails; many times she could not reply which is understandable; the messages I sent her were words of comfort to lift her spirit. I also sent her Mass Cards for Healing for which she managed to email me her thanks. Though our personal interactions have been brief, I looked upon her as a kindred spirit and am sorry that God decided to take her home so soon. But He has good reasons and now, she is enjoying the Peace that she has been seeking for and is listening right at the foot of the Master! Tokaya, share with us what you hear from the Master so that we can also be brought closer to Him! Of the many that I know will say great things about Linda, I may be the one that knew her the least, but I am proud to say that I know a lot of her Leadership and Community involvement. As a person also headed towards leadership roles in my Profession and Community, I was attached to Linda because she too was a Chemist and as I aspired to be, an established well admired community leader in the community. I did my best to emulate her soft spoken commanding leadership and great listening and communication skills. Linda never had to say what she did, the things she did spoke for her and her reputation as a leader, as a doer and as a friend preceded her and made many who knew they’d bump into her eager to do so. I feel very honored to know Linda and know that she has affected many the way she affected me. My condolences to her family. Rest in Peace Linda. Meanwhile, we met occasional in community events, and she even attended a Gawad Kalinga meeting where we had the founder, Tony Meloto, as our guest speaker… And to my surprised, she was the one to approach me that her family would like to donate money for one house, even without asking her! That’s the beginning of a very good friendship! A couple years later, she personally asked me (and she will support me) to run for the FACCOC presidency after Radi Miranda’s term.. And somewhat reluctant, as I really do not know much about the membership at that time, I accepted the challenge with her promised support (which she did 200 percent!).. and with her help I think we had a very good year with several relevant programs to help would be entrepreneurs and also the Recognition of 10 Outstanding FilAm businessmen and women and the presence of many elected government officials (from both parties) who witnessed the emerging socio-political force of the Fil Am Community! I remember Linda as the “silent” but very effective worker, in making bridges and portals for many FilAms especially with government agencies and elected officials. To me, her ACTIONS spoke louder that her soft spoken voice a thousand times! Without a doubt, what she was to me and to the FilAm community at large and to the entire human race, she lived and exemplied a truly rich life, that is worthy of emulation! And, as a past president of FACCOC, I would like to propose an annual awarding of a deserving FilAm to be Special Awardee of a “LINDA SARNO SERVANT-LEADER AWARD” to perpetuate the kind of service that she willingly gave, a true service above self. (to be chosen by the Board of Directors from nominations from the FilAm Community in So. California) I can volunteer to be a member of such committee, at least for the first year, while I have time and energy. With that tribute, I join her family and friends in saying, Rest In Peace, Linda! and may the Good Lord reward you a special place in Heaven, where there is no more pain and suffering! Good bye for now, LINDA, UNTIL WE MEET AGAIN IN PARADISE! Linda Sarno will be missed so much by so many. Years ago, Linda introduced myself and my sister Linda Young, to FACCOC and ABAOC. With this introduction, we experienced and learned about business nonprofit organizations, and we were able to meet others to increase our business relationships and opportunities, and build camaraderie with so many. Her work has touched our lives. Linda was strong in business, community and especially in spirit. You are a kind lady who treated everybody with respect and affection. We will never forget your love for the FACCOC and the assistance you extended to any member who asks you for it. As we pray for you here, pray for us in heaven. I was honored to provide a Eulogy last evening for Linda and the Sarno family on behalf of FACCOC. While I didn’t know Linda well, I’m thankful for the legacy she has left behind in FACCOC. Because of Linda, future FACCOC leaders and members have been handed down her standard of excellence in the community. Linda’s memory will forever allow us leading the Chamber to know the seriousness of this responsibility. Even in illness, she would take the time to visit us occasionally during mixers close to her home and was able to gather the strength to attend our 2014 GALA. She was able to meet with us one last time last January during our mixer at Arte Cafe and I managed to take a photo with her. Linda left me a heavy bag full of booklets, flyers, and other items she gathered during her leadership term. Every item in the bag is a reminder of how important it is to continue her legacy of inspiring and assisting business owners in the community. FACCOC dedicates 2016 in her memory. My dearest friend Linda was way bigger than life! Because of her humility and servitude to so many, this world is a much better place. I was serving as one of the Ambassadors at FACCOC when I was introduced to Linda. Unfortunately, because of my husband’s terminal illness at the time, I had to step down after a year. Linda and had so many things in common, her conservative views and her “Pro-Life Ministry” were just two examples, we were inseparable. Oh my God how she persevere, fought till the end and never weathered her physical challenge. There’s no denying that was in pain, but that didn’t stopped her from continuing her legacy, she worked and worked like there’s no tomorrow! She doubled down although she can’t no longer speak and had to feed herself every 4 hours, who would sacrificed this much? She gave it all and shared everything what she’s got. She’s beautiful person inside and out, a true servant of God. Linda my friend, you are my inspiration, my angel and my true hero. I love you, till we meet again.